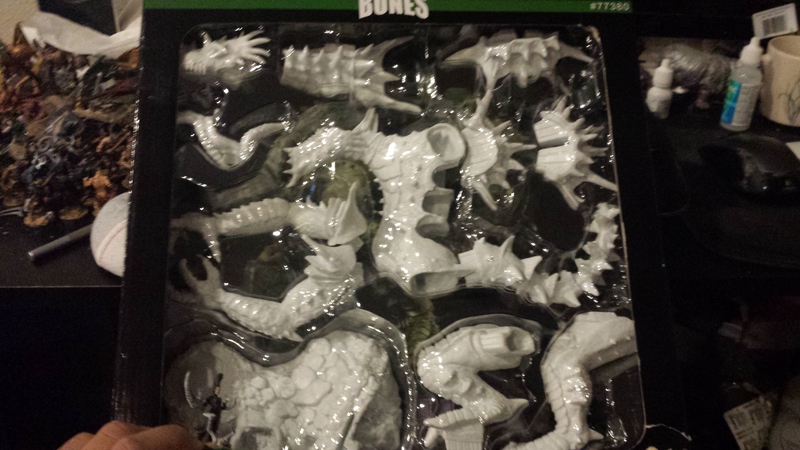 I picked up a crazy haul from the first Reaper Bones Kickstarter, so I was happy to jump in on the second one. Because of that initial haul, though, I wasn’t particularly interested in the core set of minis. For roughly what I spent the first time around, I focused up on specific things and bought a lot of duplicates: a couple scenery kits; the turtle/frogmen; many, many gnolls and bugbears (I love gnolls and bugbears so much! 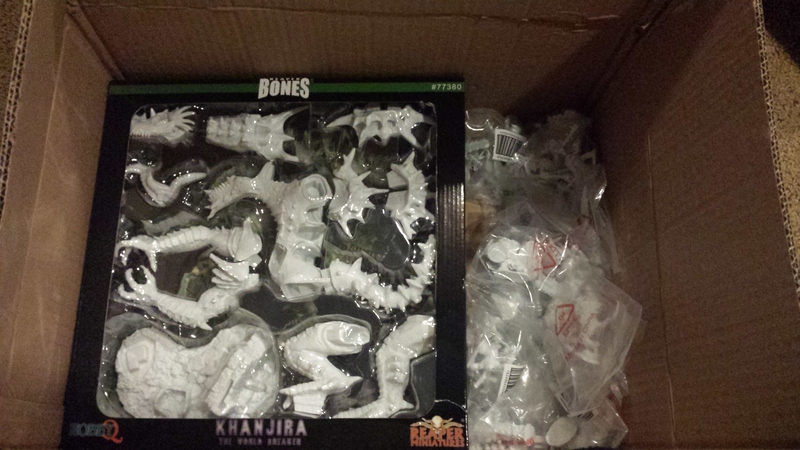 ); 3 bulettes; 2 kits of daemons plus the greater daemons; and Khanjira. I was not prepared for Khanjira. I picked it up, like a lot of the stuff, thinking “Oh, I could totally convert this for Warhammer!” That was before I’d played as much Warhammer, bought as many WH models, or come to understand the “awesome” modeling policy that my LGS has. The policy only applies to tournaments, which I don’t particularly play, and is arguably not that draconian. The problem is that it’s also not actually a policy. It’s “must be an appropriate conversion” which translates to “I or one of my subordinates has to like it.” So for someone who likes to push envelopes with what I create and the value and creativity I can squeeze out of kits, it’s simultaneously a condemnation and a challenge. They explicitly stated “No Gundams on the table” and so I went out and bought a Death Scythe model which I may build into either a Riptide or Broadside (depending on how big it comes out) explicitly to run it as a conversion. I’ve mentioned before, I’m stubborn. Particularly when it feels like a Byzantine yet unnecessary set of rules is impeding entertainment. Anyway! I got the bulettes to convert into either Fiends of Slaanesh or Beasts of Nurgle. I’ll still likely do something like that, but man, they’re big, gorgeous models. So wide that they can’t be cavalry, and just a bit wider, at the foot, than a 40mm base allows for. So at this point I’m thinking I’ll have to use a 60mm, meaning I may have just gotten a threepack of Bloodcrushers for about 12 dollars! I’ve got a Glabrezu—the sculpt from Reaper is wonderfully thin and lithe—that I can definitely see making into a Keeper of Secrets. The size is great. Just, you know, Keepers of Secrets aren’t very good. But Khanji…wow. That’s a massive model. Daemonette in lower-left for scale. Also most of my hand, if you know how big my hand is. So the only sensible conversion I can envision—and I really can’t think of a likely scenario where I’d need this for anything on the tabletop, because huge—is my very own Imperial Knight. I’ve held off buying a Knight less because of the cost (I mean, I’m not made of money, but it’s a thing I could have bought instead of a quantity of lesser things) but because they’ve yet to give the good men of Chaos their own Knights. Just…even the rules. If I had the rules, I’d happily buy up a model and convert it to have it. There are plenty of folks at the LGS who have Knights and other Super Heavies, and while I’m cool with just not playing several of them for other reasons, I’d like to have a Super Heavy in my pocket for when the time comes. So now I have a model who looks to measure almost exactly Knight size (haven’t seen the width of her yet) and no better use for her. That means I’ll likely take her out of the box, play around with some bits and some greenstuff, and see if I can convert out a servicable Knight replacement. One really nice thing with Khanji is that she’s already multi-part, so magnetizing complete limbs will be easy and the overall model could probably be broken down for easy transport. That will also allow me to pick and choose from amongst the various Knights, though I can’t see going for more than one or two options. It also, hopefully, leaves me flexible should actual Chaos Knights come out sometime soon, though I’ve not seen any rumors suggesting that. Obviously, as that project gets underway there’ll be pictures and the like. Posted in Hobby, Warhammer.Tagged Conversions, Reaper Miniatures, Warhammer. Why don’t you have an About page? You know, it legitimately never occurred to me to write one. I transferred this blog over from a blogger site years ago, and I didn’t apparently didn’t attend to such maintenance tasks. Glad you like the picture; one of my sisters found it for me, and it was perfect! About & the Contact pages are a crucial part of any blog. It’s good if you write one asap.